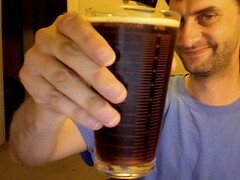 Before the whole DoJ debacle where homebrew judging was banned, I’d made an Irish ale to be judged at the OBC event. However, I didn’t start soon enough and my beer wasn’t ready in time, so now it’s just there to be judged by me. This beer is closer to a porter than I would like or at least than what I thought an Irish ale ought to be about. Still an amber hue to it but very dark and the coffee notes are prominent. Nose; coffee, flavors; coffee. Which leads me to ask if this is the way it’s supposed to be? My answer is; despite reading recipes, I just don’t know. I haven’t drank enough Irish ales to say! Sure, it’s a decent beer and I wouldn’t hesitate to offer it to strangers but is it what it’s supposed to be? I have no idea. So next time, if I’m working in a style I think I’m going to try and do some research so I know what I’m shooting for. Hard work I know but someone has to do it. I mean, just look at this. Pale ales in Pinot Noir barrels, bock and tripel in whiskey barrels, scotch ale in apple brandy barrels, juniper ales in gin barrels! And that’s alongside the traditional, fantastic pairing of stout aged in bourbon barrels, coupled with a concoction by Cascade that is a mystery prize! Holy crap. They all look interesting at minimum and part of my “Gimme” strategy at best. Hell, I’d drink most of these beers even if they hadn’t been barrel aged; the fact that extra time and effort went into them just makes this all the better. Plus, Fuz is coming into town, so we’re off to hit Bailey’s Saturday and I’ll have my (bleary) notes and photos on Wednesday. I wasn’t going to come to this joint, because it seems like an eatery first, bar second-which amorphous as it is, is my only criteria for a Local but Bill suggested I check it out. So here I am. Nick’s has been around since 1935 but I didn’t come into the place until late 2009 because every time I walked by the place, it was closed or very, very dark. So I assumed that it was owned by the Mob. Call it Occam’s Imaginary Razor; the most likely preposterous explanation is the one your brain will come up with and run. What was I supposed to think? It was a bar in a bustling, hip neighborhood that nobody ever seemed to go into or out of. How does a place like that stay open, except as a hideout for shady businessmen? Admittedly, it’s not the most interesting theory. It could’ve been a bar sent back in time through tachyons, a haunted space from the future, full of newspapers with terrifying, Fark ready headlines like: Redheads extinct, California quake splits state, raises Godzilla, Liz Cheney ‘elected’ President, Aliens have mercy, kill us all. But no, I simply go with Mafia. Not really a great writer’s imagination at work. According to the timeline though, Nick opened the place, sold it to Frank, who retired in ’08 and sold it to Ty who spends a year or so renovating the place and…here we are. Yet, despite all that history and an overwhelming amount of sports related memorabilia on the wall (much of Yankee related) Nicks doesn’t feel like there’s much of a vibe here. The music is early 90’s alternative. The TV is baseball or softball. There’s nothing wrong with this place but I’m not sure what is here to bring me back. Look at it this way; if you read this blog, you’re reading in part for my perspective. 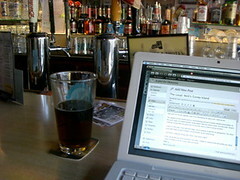 The other good beer blogs around Portland (or anywhere) do the same thing. And there’s nothing wrong with Nick’s, but what’s right? Well, let me tell you; they have their own beer. I doubt it’s brewed here but unlike any other place I’ve been to on the Local, they have their own brew, Nick’s TKO, an amber bock that’s malty enough to put up a good backbone against their food and fizzy enough to wash away the flavors and get you ready for the next bite. That’s pretty cool, as far as I’m concerned. Sure, it would’ve been pretty awesome to have a haunted time-travelling bar from the future but a nice bar with a decent amber is a close second. Also; the service is good. Bartender was prompt, friendly and from the neighborhood. I like that. And next time, I think I’ll arrive hungry. The menu seems to have a certain swagger when it comes to their food; I think I’d like to put it to the test. But man, I love the Brew Dog guys. Busy–and work has kept me from doing what I need to do-this blog. So this post is a note that the Super Duper Dog is on tap at the Lucky Lab right now. My girlfriend loves the SDD. So, Fuz comes into town and we have a chance to get a beer. You’re gonna drink an imperial wheat IPA, that’s what you’re gonna do. In a way, this is a preview to the 31st, when Bailey’s 3rd anniversary event happens. There will hopefully be more people in my party but Fuz and I will, in our own way, form the core of people there to amuse ourselves on interesting beers. As a matter of fact, it’s him who points out the Cascade Imperial Wheat has a metallic flavor-an interaction, he thinks, between the wheat and the hops. Personally, I like what the wheat has done for the mouthfeel of this beer; it’s softer, a bit fuller, but the metallic sensation is a twinge off putting. Too bad, because I want to like this brew. Unfortunately for the both of us, Fuz’s Double Brown on nitro doesn’t fare much better. 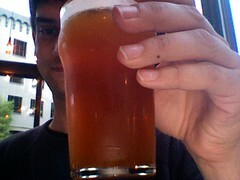 The coffee nose is a bit too strong for my tastes, and this brown on nitro just doesn’t seem to benefit much. That’s OK though; Great Divide’s Yeti awaits and GD never disappoints. We’re a nerd couple tonight-Fuz is doing some work on his laptop and I’m doing this blogpost. It’s almost adorable. I feel a bit calmer here. After the Local is done I think I’ll come back to Bailey’s again. Not just because the beer selection offers more variety; the space just offers me the ability to settle my mind and observer a little more. Not that my adventures are done. Oh no. There are some wonderful places to visit and I don’t want to be found lacking-but it’s always good to find a few home bases. I was reading this post at the New School and it just reminded me; I haven’t been to the Rock Bottom in a long time, and they do fantastic brews. And just yesterday I went by Beermongers to get some brews for the podcast, which reminded me that I like that store too and I don’t get there enough. All of this, of course, serves to remind me that I haven’t been to the Slingshot lounge in wayyy too long. Although I have been recently employed, money is still an issue and that can make me a little reluctant to head out; almost a mental block, even. However…I like to patronize the places I dig on, especially the ones that aren’t extremely popular because that helps ensure I have a place to chill out and play cards. With all the pubs out there, what reminds you to go back to one you liked?